As part of the G20 summit heads of state and government are in Hamburg, Germany. On Friday protests intensified by opposition groups, with the aim of blocking the multilateral meeting. According to the German police, some people attempted to gain access to the high-security area in which the leaders meet, resulting in intense confrontation to halt acts of violence. Several masked individuals set fire to vehicles that were stationed in different parts of the city, in extension to attacking businesses and a police station in the Altona neighborhood. It was also told that demonstrators fired pyrotechnic rockets at a police helicopter and Molotov bombs at the agents. According to recent reports, so far there are at least 159 policemen injured and 45 detained. 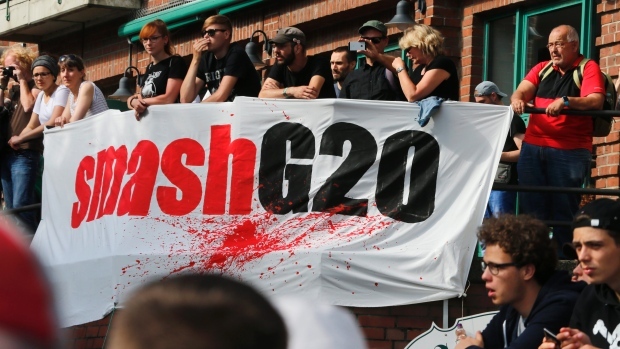 More than 12 thousand people left to march in the streets of Hamburg, Germany, against the G20 summit that begins tomorrow in that city. The police had to resort to violence and the use of water cannons for demonstrators to disperse. The people who left to go were dressed in black and wearing balaclava, many of them used stones, bottles, and firecrackers against the police. The entity had to announce on Twitter that the organizers of the march began to comment that people are better off. The police decided to dissolve the rally – called “Welcome to Hell” – as it attempted to approach the convention center where the summit is on Friday and Saturday. 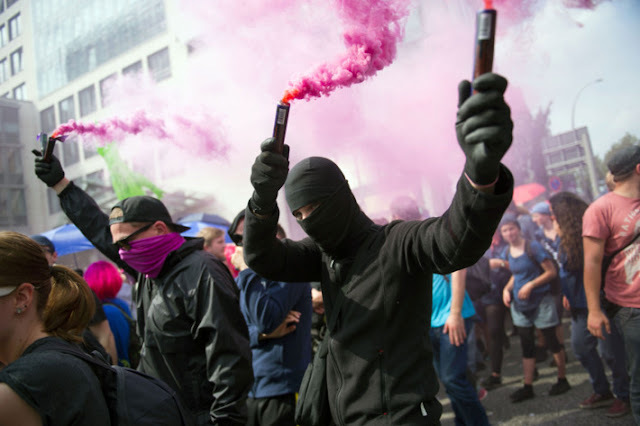 The protest was called by the self-proclaimed “autonomous and anti-capitalist alliance” and is one of the most important of those planned in the city coinciding with the G20. The march, headed with a large banner that asked to “pulverize” the G20 (“Smash G20”), was aimed at surrounding the convention center. Also, on Saturday another large demonstration called by extreme left groups is planned. 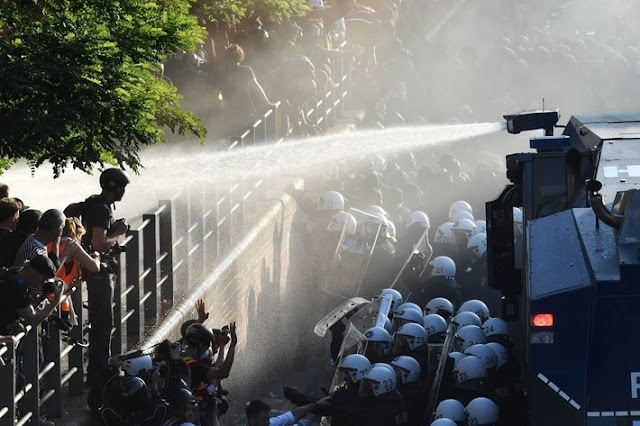 The authorities deployed in Hamburg about 20,000 police from all over Germany as an anti-terrorist measure and to prevent the violence of the nearly 30 demonstrations planned during the summit.